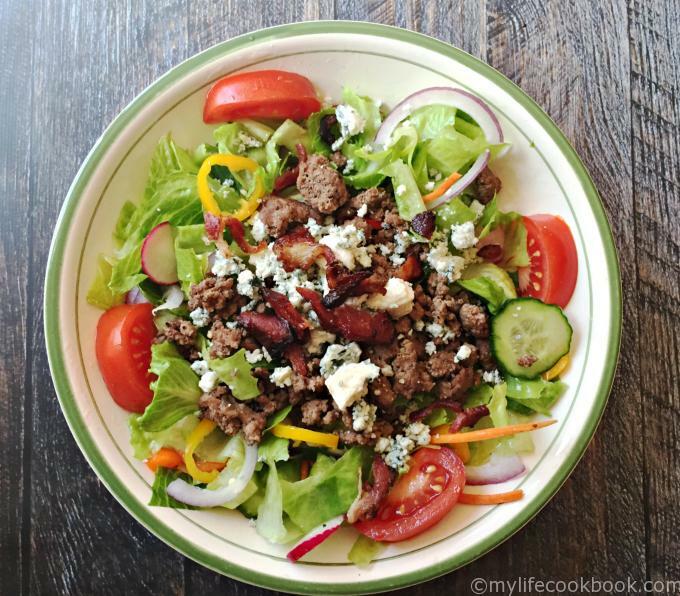 Low carb bacon blue cheeseburger salad for when you’re craving a burger but not the carbs. Even if you aren’t counting carbs, this burger salad is yum! You might also like this low carb Big Mac salad! I love salads. I eat them almost everyday and I never tire of them. Of course I am loading them with beef, bacon and blue cheese so it’s not like I’m watching my calories or anything. But I’m using good ingredients when I can, like grassfed beef, uncured bacon and good quality blue cheese and trying to keep it low carb and Paleo. 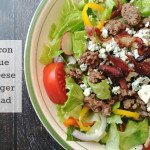 Regardless of diet considerations, this low carb bacon blue cheeseburger salad was so good that my husband and I both ate this for dinner on Sunday and loved it! I have many salads on this blog but this is one of my favorites. I also really like my taco cobb salad , Italian sub salad and big mac salad. So if you enjoy this one, please check those out as I’m sure you will love them too! I like to put lots of veggies in my salads. I scour my refrigerator and counter top and put whatever I have on hand, into my salads. Today it was romaine, cucumbers, radishes, orange and yellow mini peppers and red onions. You can put all of these and more in your salad or nothing at all. It’s up to you. However I would suggest a crunchier lettuce like Romaine or Iceberg to hold up the to heavier toppings. Next I whipped up a simple lemon vinaigrette. It was just lemon juice, olive oil and salt and pepper. I used a 2-1 ratio of lemon juice to olive oil but taste it first to see if that’s to your liking and adjust if necessary. At the same time start to brown your meat and get your bacon going. 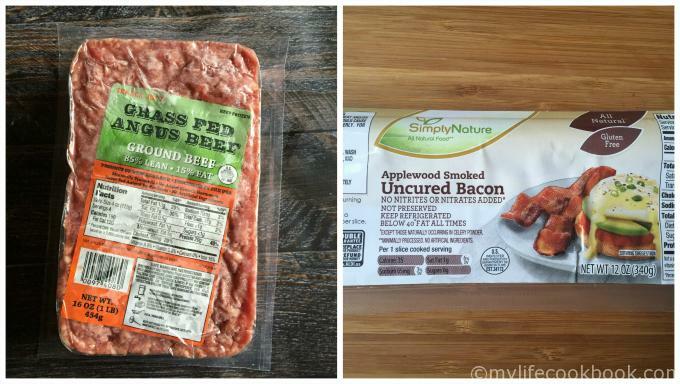 I pick up a couple packages of this grass fed ground beef at Trader Joe’s every time I go. You can find it in the freezer section. I also buy this uncured bacon every time I go to Aldi. It’s really, really good. As the meat is browning, sprinkle on some Montreal steak seasoning. I think this gives it more of a burger taste, however you can use whatever seasoning you like or just salt and pepper. After both the bacon and meat are done all you have to do is assemble. 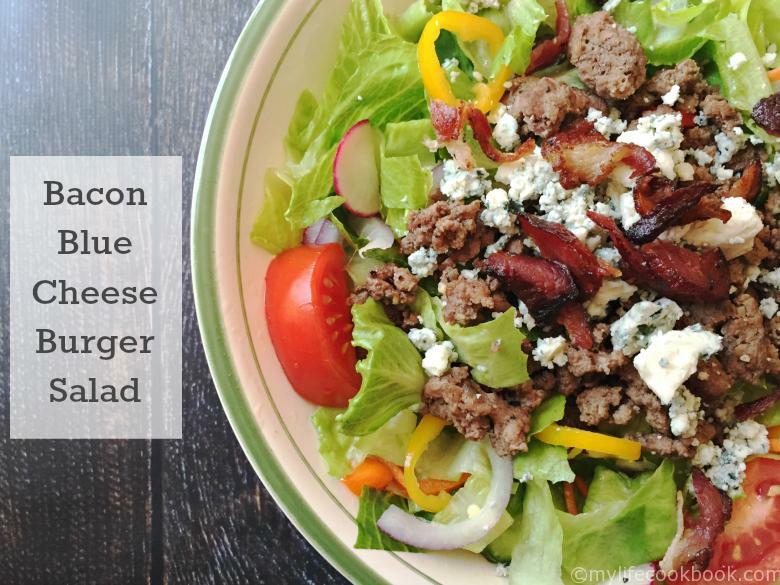 Low carb bacon blue cheese burger salad for when you're craving a burger but not the carbs. Even if you aren't counting carbs, this burger salad is yum! Sprinkle with Montreal steak season and continue to cook until done. In a separate skillet, brown your bacon. While the bacon and meat are cooking, prepare your dressing by whisking the lemon juice, olive oil and salt and pepper. Taste and add more lemon or oil if needed. Prepare your salad base by chopping the lettuce and vegetables to your liking. Toss your salad with the dressing and then fill two plates with the salad. Top with as much ground beef mixture as you like. We used about 1/4 lb of meat per salad and kept the rest for the next day. 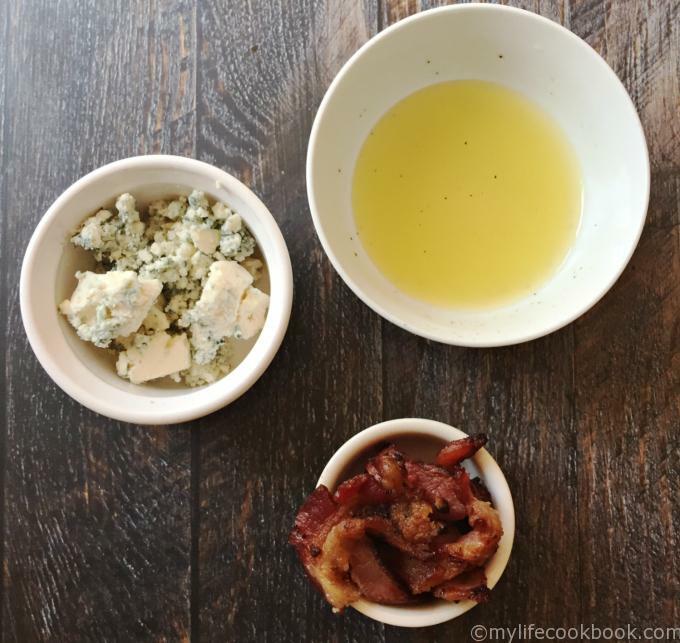 Next crumble your bacon and top with blue cheese. Previous Post: « Ham and Cabbage Soup – A great soup to make with leftover ham! 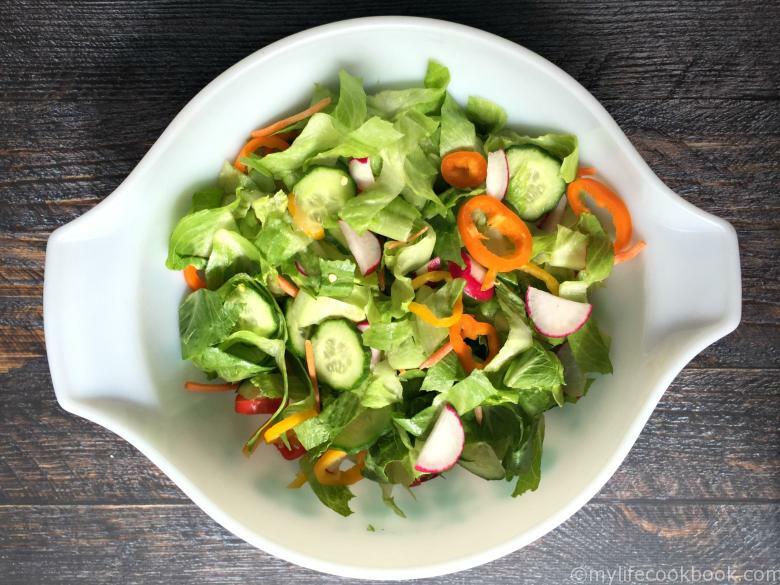 This is such a perfect salad for spring and summer! Thank you for sharing it on Show Me Saturday! You are totally speaking my low carb loving language! Thank you so much for the awesome recipe and for sharing on Show Me Saturday! I can’t wait to try this for dinner! Stopping by from the Home Matters Linky party! This just looks so so yummy! Loving this salad!! So much, in fact, that I chose it for my fav from this week’s Teach Me Tuesday party. It will be featured at next week’s party. Stop by and get a featured button if you like. Thank you Bobbi! You made my day! I love this! Three of my favorites, bacon, blue cheese and burgers.